Ok, so how to shut off your mind? What I do when I want to consciously stop my mind from interfering with my soul, is I lie down on my bed (or sofa), put in ear plugs and just listen to my own breath and concentrate on it. I feel each breath enter my body, go down my lungs (making my belly rise) and go up through my throat again (making my belly deflate again) and out again through my mouth/nose. Any thoughts that rush in are just observed as being thoughts, and rather than actively pushing them away, I simply focus on my breathing again. This takes some practice. ..ok it takes a LOT of practice. You may not always be consciously aware that you are “thinking”, but sooner or later you will remember that you were trying not to think. So then just focus on your breathing again. After a while this will become second nature, and you’ll experience less difficulty in doing this. So when your mind has given up its attempts to take over your consciousness, you may begin to see images, feel certain feelings/sensations, hear certain things. Do not analyze them, simply observe them and leave them be. At a certain point in this exercise you’ll no longer have the urge to analyze what you’re experiencing. Your mind will no longer wonder what the heck is going on. You are now in paradise, free from the burden of every-day mind-activity. Your soul rejoices. You are now living in the NOW, being all there is. When I last astral travelled during the New Moon, I had the honour of finally meeting Cerridwen for the first time. animals, to a middle aged woman with extremely thick, frizzy white hair bound together in a bushy tail. I scrambled to my feet and accepted a furry cloak to warm my trembling body. In order to speak with her I had to give her a gift, so I gave her the turquentine necklace I was wearing. 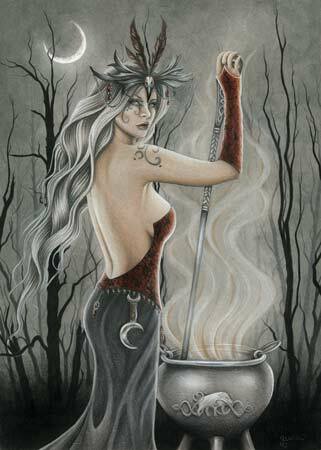 She then beckoned me and instructed me to stare into her cauldron. Faintly skeptical and unsure of what I would see, I obeyed. The water in the cauldron turned into a whirlpool and sucked me in. When the world stopped spinning I stood in the middle of the woods: it was day and a person I had wanted to see stood beside me. All in all, what surprised me the most is that Cerridwen did not come across as a daunting, intimidating character. She rather came across as an older friend in possession of wisdom that has been gained through the years and with a mocking sense of humour. The Morrighan to me always appears more like a mother figure, Branwen is the tender, considerate one and Rhiannon is more aloof. It is interesting to see how every goddess has their own personality and how this colours your dealings with them.